Travel back in time in this essential mini encyclopedia to the mighty Roman empire, with all the information you need to know about gods, gladiators, baths, battles, and more! Did you know that audiences of up to 50,000 people watched entertainments in the Colosseum in Rome, and their tickets were numbered pieces of broken pottery? Or that Romans went to public baths to get clean, but there wasn't any soap as they rubbed themselves with olive oil instead. No? Then you need this brilliant mini book to learn the really important facts about one of history's greatest civilisations. Packed with pictures, Pocket Eyewitness Ancient Rome uses bite-sized chunks of information, including amazing stats and facts, to make learning fun. 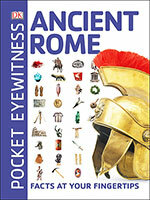 Ideal for school projects and homework assignments, Pocket Eyewitness Ancient Rome is the perfect guide for young historians.Travel back in time in this essential mini encyclopedia to the mighty Roman empire, with all the information you need to know about gods, gladiators, baths, battles, and more! Did you know that audiences of up to 50,000 people watched entertainments in the Colosseum in Rome, and their tickets were numbered pieces of broken pottery? Or that Romans went to public baths to get clean, but there wasn't any soap as they rubbed themselves with olive oil instead. No? Then you need this brilliant mini book to learn the really important facts about one of history's greatest civilisations. Packed with pictures, Pocket Eyewitness Ancient Rome uses bite-sized chunks of information, including amazing stats and facts, to make learning fun. Ideal for school projects and homework assignments, Pocket Eyewitness Ancient Rome is the perfect guide for young historians. DK Reads: Star Wars: Rey to the Rescue!